French-Mediterranean refinement at The Lowell from La Grenouille restaurateur Charles Masson. 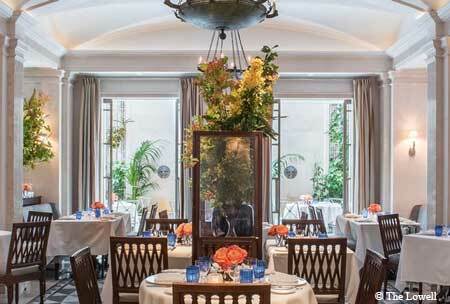 About the restaurant & décor: Diners who fretted over restaurateur Charles Masson’s departure from La Grenouille have nothing to worry about. His venture, Majorelle, is equally lovely and refined, set in the middle of The Lowell in the space previously occupied by Post House. The room is elegant and filled with as many beautiful flowers as the beautiful people who frequent it. The seating in a greenhouse-like area overlooking the outdoors is most desirable and a quiet refuge to hear the recitation of the evening’s dishes and enjoy a preliminary glass of Champagne. Likes: The embodiment of romance and elegance. 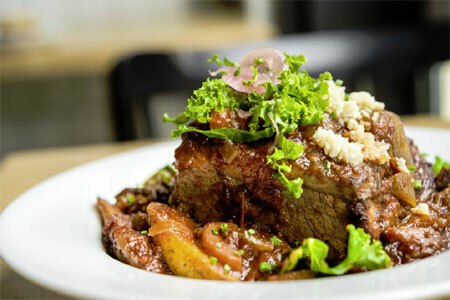 Food & Drinks: Majorelle serves up classic French dishes with Mediterranean influences. The prix-fixe menu has choices like a frisée salad with poached egg or foie gras au Sauternes to begin. Dover sole and steak au poivre feature as entrées along with Mediterranean tajines, made with lamb or snapper, and a vegetarian couscous option. Desserts such as the tarte Tatin are delicately plated and allow for a careful sampling of textures mixed with flavor. A carryover from La Grenouille are the airy soufflés. For those in a rush, the express lunch is a real deal at $40 for two plates in 40 minutes. The wine list is heavily French in orientation but has hard-to-find picks, too. The sommelier will assist you with your selection and can also suggest a glass of an unusual dessert wine to finish the meal. Majorelle is a fine destination for a special occasion when you want to be treated like royalty.